Hello, ReFoReMo-ers! Here are 10 of my favorite books that I’ve read countless times. Of all the books on the list, this is the one that inspired me to make books of my own. With Lane’s beautiful and hilarious illustrations, Jon’s irreverent spin on a classic fairy tale, as told by A. Wolf, is a good reminder to consider a new perspective and voice for a story. This story about a dog and his owner made me laugh out loud the first time I read it (a line about“beef bits” still kills me!). It’s peppered with snappy, sometimes sassy dialogue and her gorgeous illustrations add even more humorous details. I’m always inspired by Petra’s ability to create stories that are sweet yet uproariously funny. This is another Petra Mathers gem, as is the whole Lottie’s World series, with a cast of characters that couldn’t be more charming. A scene with Lottie, her new beach towel and a cooler brings me to my knees with laughter. It exemplifies how common, everyday experiences can be potential comedy gold. All of Maira’s books remind me to play with words (and art!) as they explore poetry, prose, onomatopoeia (which I read is her son’s middle name! ), alliteration, made-up words and what seems like stream-of-consciousness writing. 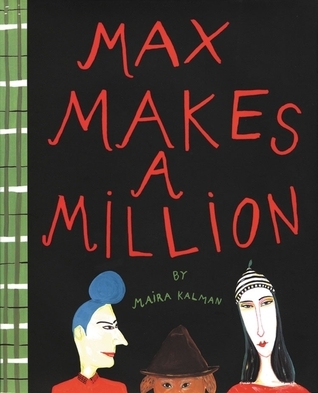 This book (and series) in particular about Max the dog – poet and dreamer – highlights the importance of creating a well-thought-out, lovable main character. The competitive narrator goat in this “classic Bob Shea” book has one of my favorite opening lines ever. Full of attitude from start to finish, this is a hilarious take on the ups and downs of making new friends. 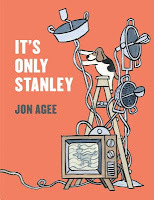 Jon’s detailed drawings, clever phrasing and spot-on rhymes provide a fresh perspective on the passage of time as Stanley the dog keeps his family awake all night, building toward the funny, surprising ending. COMEDIC GENIUSES…the voice, the pacing, the illustrations…these two guys are BRILIANT together (another favorite is Those Darn Squirrels!)! I heard Jules read this book to a group of kids and adults and they were all in stitches. It’s wonderfully preposterous and reminds me to push the writing limits to the “enth” degree. Three dust bunnies utter rhyming words and a fourth continually breaks the pattern with sidesplitting results. 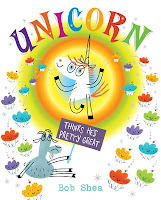 It’s not easy writing funny beginning reader books but Jan Thomas does it perfectly every time. Doreen’s masterful use of silly puns, simple, droll text, along with Harry’s adorable illustrations, shows us the highs and lows of a day in the life of an endearing worm. The three-book series (a fly and a spider each have their own diaries) is the perfect example of how to combine fiction and non-fiction elements in a delightfully humorous way. Laurie is giving away one copy of either Arnie the Doughnut OR We Are Growing! to one lucky winner at the conclusion of ReFoReMo. To be eligible, please comment on this blog post and make efforts to read mentor texts regularly. Laurie Keller grew up in Michigan and entertained herself for hours at a time writing stories, drawing, painting, sculpting clay – She loved doing anything artistic. She'd always taken art classes through high school, but never realized art was a career option. She started taking education classes at the local community college with thoughts of being an elementary teacher, but also considered majoring in dance as she spent much of her time performing in the college's repertory dance tour company and choreographing and dancing in civic theater productions. One day her friend took her to a student show at Kendall College of Art and Design and everything changed. She was so impressed with the work the students were doing and excited about the possible career opportunities in the art field. She enrolled the following fall, and a few years later graduated with a BFA degree in illustration. Upon graduation she got a job as a greeting card illustrator at Hallmark Cards in Kansas City, Missouri. She eventually started designing (and occasionally writing) greeting cards for kids. She spent many lunch hours and weekends at a nearby children’s bookstore (The Reading Reptile) looking for artistic inspiration with co-workers. She didn’t have kids and hadn’t looked at children’s books in many years. She was blown away by the fantastic books she was seeing. Laurie started collecting them and it soon became her dream to write and illustrate her own books. One night while falling asleep, some little states with arms, legs and faces popped into her head (happens to all of us, right?). The next morning she remembered that and thought up the idea for her first book, The Scrambled States of America. She naively took it to New York City to try to find a publisher, and amazingly, got several appointments. To her surprise, she fell in love with NYC and decided, after seven and a half years, to quit her job at Hallmark and move there. Over the next six months while preparing to move, she got a few rejection letters but didn't get discouraged. Then, the week after she quit Hallmark, she got a call from Christy Ottaviano at Henry Holt telling her they wanted to publish my story. WOOHOO! They hit it off right away and have been working together ever since. Laurie feels very fortunate to have a career that she loves. She's met so many wonderful people as a result – kids, parents, teachers, librarians and other authors and illustrators that she admires. She loved her time in NYC but moved back to “The Mitten State” to be closer to her family. In addition to creating books, she enjoys playing the banjo (nope, that's not a typo), traveling, reading, walking in the woods and along Lake Michigan and playing with her cats. You can follow her at www.lauriekeller.com. Love your list of books, some I have read others I must read. Loved reading about your journey. Thanks for the post. Thank you for the great list, Laurie! I also liked reading about your journey. Thank you for the pb brief. Some of these books I've read but I'll keep my eyes open for the ones I haven't. Thank you for sharing your story. Today's list made me realize what a small place I live in - most of these books are not in any libraries in my region, which includes two counties! Despite that little hiccup - my takeaway from today is that humor and playing with perspective can take any idea from good to fantastic :) Thanks for sharing! Thank you for your post, Laurie. 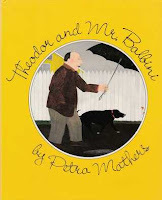 I particularly enjoyed the humorous picture books and how the illustrations complemented the text. This is a wonderful list of books! And I'm glad you shared the story about yourself -- very inspirational! The True Story of the Three Little Pigs is one of my all-time favorites. It's witty and hilarious. My mss have heart, and I'm looking to add humor. Thank you for these wonderful examples. I think Bark, George! was the most surprising book I've reading in awhile. What was I expecting from all those animal noises? I don't know, but it wasn't that haha. Great post! Laurie, great compilation of books that have humor at their core. I am going to enjoy these all. Congrats on your successes, too. Would love to win either of your books. Thanks for sharing! I'm curious about "Theodor and Mr. Balbini." And the cover of your book, We Are Growing, looks funny. Thank you for your engaging recommendations! I am thrilled to see you're a fan of Petra Mathers! She is my hero! I've been collecting her books for years. But reading your whole list of books here was a pleasure; couldn't agree more with your picks. I've also read your ARNIE, but not yet WE ARE GROWING. Can't wait! Thanks, Laurie! Thanks for your list of wonderful books. I'm putting the ones I couldn't find or haven't read on hold. It must be fate! I just picked up your book, WE ARE GROWING on a whim from the library. (Is it on Carrie's list too??) Great choices! I'm not sure I could narrow my favorites down to a top ten, but then, picture books are so easy to love! Great list! And you're the creator of Scrambled States!! We absolutely love that game... have played for years!! Thanks for a great list of books and your perspective on them. I love your choice of mentor texts and your books make me and my kids giggle every time we read them! Super list. Coupled with your commentary, I learned something important from each. Thank you! Some of my own favorites are on this list and some new ones to definitely check out. Thanks so much for this great list! I also love The True Story of the Three Pigs and read it multiple times to Kinders and First graders. I cannot wait to read Rhyming Dust Bunnies. Thanks for these suggestions. I love Rhyming Dust Bunnies and Unicorn Thinks He's Great! I'm going to check out Petra Mathers and others. Thank you! Kids are so drawn to funny books - I really liked reading and thinking about some of these ones, and will have to look for the others. Loved hearing Laurie's story. Her statement that she didn't know drawing could be a career choice is so important. We need children to realize that the arts in general can become career choices. And the books of course are great choices! Funny books are always a hit. Some of Laurie's were new, delightful surprises for me. Thanks, Laurie. Love your story, looking forward to reading your suggestions. 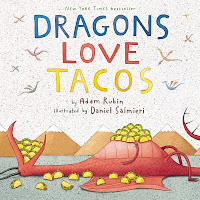 Great books, but out of them all, Dragons Love Tacos is one I keep checking out of the library. Because you know (just by the title) that hot sauce and dragons are going to give somebody heartburn. Laurie, thanks for sharing the books and your biographical journey. What an awesome list! Some I know, and that makes me excited to read the ones I don't. If they're half as good as the ones I've read, they will be wonderful mentor texts. Thank you for the great post! Two of my kids favorites on today's list. Dragons Love Tacos and Unicorn Thinks He's Pretty Great. Thanks for sharing. 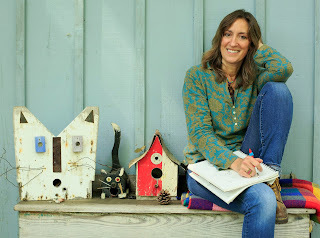 So nice to learn more abou Laurie and her writing and illustration journey. Thanks, Laurie, for posting your favorites. I was working on a wolf and 3 pigs story, and see now my title won't work as it's been done. Research is important. Thank you for this great list. I have read some and look forward to reading the rest. I struggled with reading as a child and even into my teenage years, but I remember when my father bought me a copy of The True Story of the Three Little Pigs, I feel in love with a story for the first time ever. I actually wanted to read, even if I sucked at it. Thanks for listing these other great books, some I was not aware of until now. Many thanks! My kids grew up loving The True Story of the Three Pigs. I have read five of these stories already and they took me out of my comfort zone in picking PB to check out. Thank you so much for opening up my world. Wonderfully silly choices! Thanks for sharing your inspiring journey, Laurie. Thanks for a great selection of books. They defiantly inspire! Adding a number of these to my reading list! The rest to my re-reading list! Thanks for the recommendations and insight. "We Are Growing" funny because of your list! Thanks for the great list. Diary of a Worm is one of my favorites, I giggle through the entire book every time I read it! Lots of titles new to me. Thanks for sharing your story! These were so much fun to read...Thanks! I love humor, and your book suggestions are perfect mentor texts. Thanks, Laurie! Thanks, Laurie. this is a great idea to read a few books just before writing to set the mood. Great list, Laurie, thank you! So much fun to read all of these wonderful books. Wishing you continued success! Thanks for this list of mentor texts, Laurie! Great list, Laurie, and reasons why each choice made the list. Thank you! Than you for your list, Laurie, and the book that inspired you to start your journey. I think mine was FANCY NANCY. Thanks for sharing this wonderful list of mentor texts, Laurie, and I really enjoyed the story about how you got your start, too! Great post, Laurie! Thanks for sharing your insights, your story and these fun books. Thank you Laurie for the list. I loved journey. Nice list. There are actually a few here which I haven't read yet. Love getting new recommendations! What a great list! My kids love books that make them laugh. Thanks Laurie for your sharing your I sights. I really liked your description of Doreen Cronin's style of combining fiction and nonfiction in a fun way. Lots of fun titles there - a few I'll have to hunt down as I have not read them yet. Thanks for sharing your perspective and inspiration. 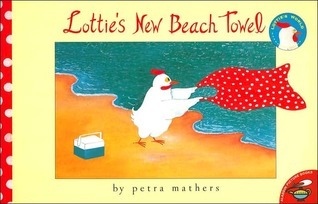 I used to read Lottie's New Beach Towel to my kids over and over again. Thanks for reminding me of an old favorite, Laurie, and for introducing me to some new ones! Love this post and the books! Thank you for sharing with us. There are a few that are not in our library system, but maybe I can get them through interlibrary loans. They will just love me! What an outstanding list of hilarious PBs. Lots to love here! Thanks for sharing your writing and illustrating journey with us, Laurie! Great book suggestions too! Great list of books! I love hearing that you get in a "silly" writing mood. Maybe that helps add humor to your stories? I will try it. Thanks. Great list! And what a coincidence--I just reread Diary of a Worm earlier today before seeing this post. Cheers! Thank you for pointing us to the humor! Kids love to laugh. Such a good point that there is much humor to be found in everyday things. I didn't realize before that The Scrambled States of America was your first book. My son and I read that one again and again. Laurie, I can see the natural progression to go from writing and illustrating greeting cards to kidlit. Your background brings it all to fruition for you which is great for children everywhere and us adults who love reading pb's. Good luck with your next book. Looking forward to reading your next books. Thank you for the great post! As a fellow dancer (and dance major), I enjoyed reading about how you got to where you are. Congratulations! You've featured a few of my favorites. Now I'll look for the rest! Thanks! Thank you for sharing some of your favorite mentor texts. Humor is golden for children and adults alike. I have many of these titles. Am anxious to type them out to get a feel for their structure. Thanks for sharing. Thank you for introducing me to Petra Mathers! I found the author bio in Theodor and Mr. Balbini one of the funniest bits in the entire book! I laughed out loud and wished there was someone else in the room to show it to. The snarky narrators are fun! 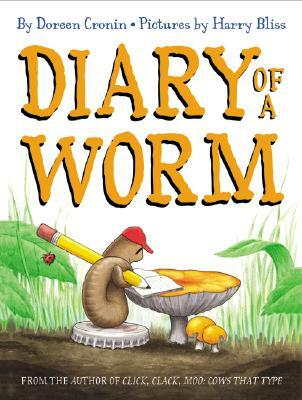 Diary of a Worm was a favorite back when I worked at nature camp-- it was fun rereading it today. And I remember picking out the 3 Little Pigs one from my book fair as a kid! Both my kids loved Rhyming Dust Bunnies and Bark George. Great for reading out loud. Thanks! Great selections! I think Bark, Dog was my favorite. Thank you! Thanks for sharing this terrific book list! I'm not familiar with a few of these selections- All seem like terrific mentor texts and I'm looking forward to reading them! Thanks very much for this post! I love humorous books! Great list. thanks for a great list- can't wait to read the ones I've missed. 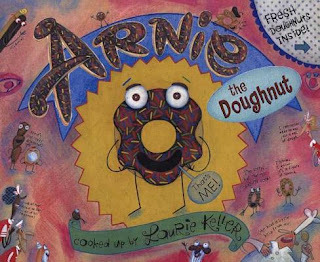 And thank you for your books- my family has loved Arnie the Doughnut ever since a very generous parent gave it to each child in my oldest son's class as a preschool-graduating gift! Great recommendations for funny, well-written books. There were a few new ones for me to explore! I am also in awe of Dragons Love Tacos. Great to see it on your list! I'm excited to check out a few titles I haven't read as well. Thanks! I was glad to learn a bit about your background, Laurie. We're fans of your books in this house! I know most but not all of the books you mentioned in the post - I'll check out the rest! Well. That was fun! I loved Max Makes a Million, and It's Only Stanley. Bark, George and Stanley had those great surprise endings! 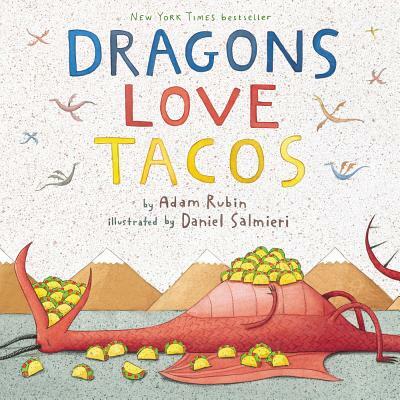 Loved Dragons with Tacos, looking forward to reading the rest! Laurie, your books have me laughing out loud when I read them :) I love humor and I thank you for sharing your favorite books. I love It's Only Stanley. I love reading humorous books but I am not so good at writing them. Thank you for a great mentor list. 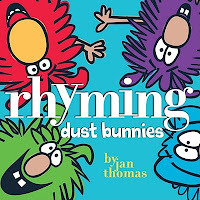 Rhyming Dust Bunnies is my six year old's favorite! Loved reading and rereading these! Some of these go way back to my favorites list. I laugh with each which makes them memorable! BTW, I love your book, Do Unto Otters! I own it and have probably read it 50 times to students and grandkids. Thanks for a great post! Great list. 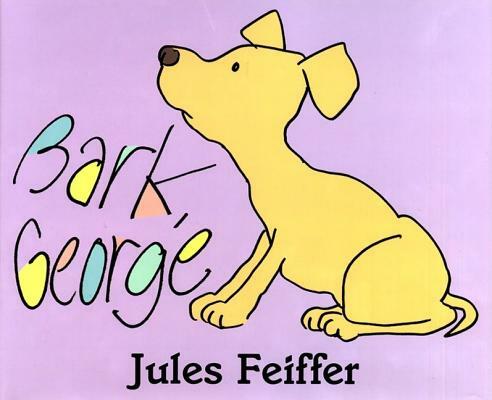 Bark George is one of my all time favourites. In fact I did a workshop for parents in which we made a George puppet for retelling the story with children. The parents had as much fun with it as I did! Great post and mentor texts, Laurie, thank you! I really love The True Story of the 3 Little Pigs as well! Thanks for sharing your favorite books, Laurie. I am familiar with most of them. I'll make a note to find the ones I haven't read yet. Nice to see some great oldies in here (Maira Kalman esp!) -- and a bunch I don't know! Thanks!! Thanks, Laurie. I'm looking forward to reading the books you suggest to put me in a "silly writing mood". Thanks for the suggestions. Some of my favorites are on this list, especially Diary of a Worm. My Pre-K students always begged me to read that one over and over. Thanks, Laurie! If only our lovely Lottie had a pair of flip flops! These are terrific books and each is unique. Thanks for posting these and telling us why you chose them. Most helpful. Thanks for introducing me to some new books and reminding me of some old favourites. 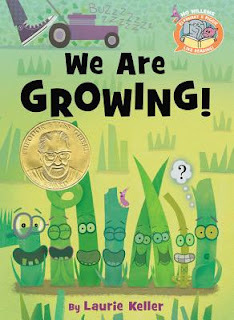 And "We are growing" is fabulous! Thanks for sharing your journey Laurie. I love the list of books. It looks like I have some reading to do. My son love's doughnut's. So we will have to track down your book. The only thing better than a book that makes me cry is one that makes me laugh! Looking forward to reading these new titles. I love silly books and each of these that I've read so far has made me laugh. Diary of a worm is a new favorite. I'm going to share it and Lottie, too, with the 4-6 year olds in my class and study them some more for my own work. Thanks for the great list of book ideas! Some of these titles are very familiar and others brand new. Thanks for the suggestions and the post! Wit and humor really contribute to re-readability in our house, so I appreciated your contributions to our reading list! Some were new to us (Bark, George & Rhyming Dust Bunnies), and some my kids have heard over and over (The True Story of the 3 Little Pigs & Dragons Love Tacos), but I see from all of your selections that you appreciate the fun that can be found in these books, even for adult readers. I'd honestly read most of these even if I weren't a parent! 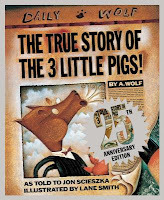 I still remember when The True Story of the 3 Little Pigs came out. It was an instant hit in my book! Thanks for your insights and mentorship to our group! I loved reading your perspectives! I'm off to research the books you highlighted. I enjoy reading all types of picture books, but those with humor are my favorite. Thanks for sharing such great examples. Thanks for kicking off March for us and for a great list of mentor texts. There are too many great ones for me to pick a favorite. A few of them I haven't read, but I'm off to do that right now. This is a great list! Re-readings are always the end goal!! Thanks for this post. What an amazing journey! Loved your post and book choices. Looking forward to studying these books! 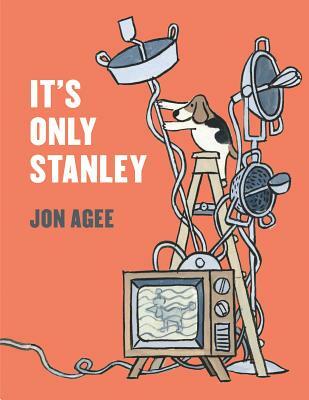 I LOVE It's Only Stanley--perfect marriage of text and art. I hadn't heard of the Mathers book, so this dog fan will be on the hunt for it! Thanks, Laurie! Thanks for the great list of books. I loved your life history too. The stars were aligned in your favor. Thanks for introducing me to these books. Hmmmm, those dust bunnies look familiar. I think they have some relatives living under my bed. I hadn't read any of these books before so thank you! And thank you for a great post. Great reviews, Laurie. I've lived in 3 Great Lakes' states: MI, IL, and MN! I loved WE ARE GROWING! Congratulations on winning the Theodor Seuss Geisel Award this year! I enjoyed my reads today!!! I LOVE how I think I've read EVERY kids book, only to discover some new greats (one of the WONDERFUL reasons I LOVE ReFoReMo SO MUCH!!!)! Most of the titles you shared I've never heard of; I CAN'T wait to read them! THANK YOU!!! And THANK YOU for sharing your story at the end of the post -- INSPIRING!!! Thank you so much for all the recommendations, Laurie! I was doing my "homework" in the kitchen this morning and my 7-year-old came in. She was off school today (bad weather) so she sat on my lap as I was scrolling through your post. She said, "Oh, Laurie Keller! She is the author of 'Birdy's Smile Book.'" :-) Birdy--which we love--together with the Scrambled States of America and do Unto Otters--more of our favorites! Thank you so much for all your work creating and reaching out to children and best wishes! Thanks for the post and the great book selections! Bob Shea always cracks my daughter and me up. I randomly picked up Lottie's New Beach Towel a couple years ago and laughed out loud--a hidden treasure! I enjoyed Dragons Love Tacos much more this time around, for some reason. Inspiring choices for voice and humor! These all sound like such fun reads. Wish I could find more of them in our library. Will have to suggest the "missing ones" to our children's librarians! Here we are on Day 3, and I'm already falling behind! I hope to catch up on these great, fun selections tomorrow, along with my Day 4 books. If only there were more hours in the day! Thank you for introducing these wonderful mentor texts to us! I can't wait to read them all! Thanks for this list! I can't wait to dive in. Also, I absolutely loved ARNIE THE DOUGHNUT and WE ARE GROWING! I love a number of these, especially Dragons Love Tacos and The Diary of a Worm. Thank you for highlighting these funny PBs and sharing your journey with us. What a great list of LOL books, love them. I enjoyed your bio very much. Congratulations! I look forward to reading many of these books. Thank you for your suggestions. Thanks for the blog. I'm especially looking forward to checking out Petra Mathers. Who doesn't love funny books?! I am enjoying reading these and sharing them with my children. It is so interesting and encouraging to hear how authors and illustrators got started, and their path to pursuing their dreams. Thank you! Several new books for me to check out. The Feiffer is a favorite of mine. Thanks! Thanks to your post my son and I revisited some old favorites and have added some new ones to our ever expanding list. Thanks so much for introducing me to some new titles. I love the humor in all these titles (and I adore Those Darn Squirrels!!) I'm looking over my list of concepts today to see where I can infuse some wit and silliness! Thanks for all your help with our research, Laurie! I'm always looking for books to get me in a "funny mood," so I love this list. Laurie's bio was pretty inspiring on its own, though! Can't wait to read and reread these funny books -- thanks, Laurie! These were fun! There's a few I'm still waiting for from the library and I'm looking forward to reading them! Almost all of these titles were new to me. I enjoyed rereading some books and some for the first time. Thank you Laurie! The true story of the 3 little pigs is one of my favorites also and got me going on this wonderful journey of creating picture books. Thanks for sharing your favorites. Thanks for this useful and fun list of books. Some are old favorites and some were new discoveries. It was just as fun to read about your journey to author/illustratordom. Thanks for sharing! I love quirky stories! Just picked up my latest books, including The True Story of the 3 Little Pigs. Thanks for sharing such a nice list! 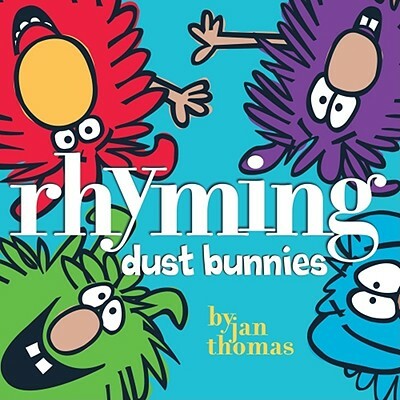 My kids ADORE the Rhyming Dust Bunnies and all her other books. They really do stand up to re-reading. All around great. Thanks for this great post. Your Scrambled States book belongs right up there with that list of classics! I love that there are so many fun details in the illustrations and that you captured states' personalities in your illustrations and dialogue! Thank you for your great post. Heading to the library now! Thanks for this fun post--so many on this list I haven't read yet! On my library list now. Diary of a Worm is a favorite. Can't wait to read some of the other books on this great list. Thanks! My comment is lost, so I will try again. I love the selection of books you mention. Many I have read and just love. Humor goes a long way toward reaching kids. Your books look fantastic, sorry to say I have yet to read them. Thanks for the great list to get me in the mood. It's interesting to see how different people respond to different books. My son read Theodor and Mr Balbini and became sad, saying "I'd never give up my dog." I had to smile. So many different interpretations. Nice reading list! Your mentor text recommendations are fantastic, so thanks for the tips. In addition, the bio bit about your personal path to pursue your professional passion inspires me. Wow, what a journey! Keep soaring! Thank you for sharing this great list of books and your reflections on each one. I also enjoyed reading about how you came to where you are now. Some books I didn't know about! Oops! Thank you! Saw BARK,GEORGE performed as a puppet show at the library for our kindergartners. Too funny! What great recommendations -- thanks so much for your time! Just read It's only Stanley and Dragons love tacos. Both are funny and fun and well-written. I'm looking for Days 4 and 5 and can't find them. Help anyone?!! Thanks for the great mentor text suggestions; some are familiar, I look forward to reading all of them! Laurie - thanks for great mentor texts...I love them all, especially Diary of a Worm! And thanks for sharing your personal story - so inspiring. Ooo! Some books I've not read before. And a few I love--Like UNICORN THINKS HE'S PRETTY GREAT. Your descriptions of these books remind me to read them over and over with a writer's eye, too. But sometimes that's hard to do with books that are just so entertaining. Thanks for the great post. Great list, thank you! Dragons Love Tacos, one of my all time favorites. My 7 year old twins still cackle out loud after many, many reads. Thank you for your insights. Can't wait to read "We Are Growing"! Thanks for sharing your top 10! I enjoyed your list of humorous picture books. 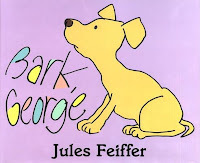 Bark, George and It's Only Stanley are two that I'd like to use with my beginning readers at school. A lovely Top 10, thank you. Some great old favourites and new ones to work through. Humor is my favorite genre (Don't Let the Pidgeon Drive the Bus), and some of these were new to me (okay, I may be kind of old, but I'm fairly new to current kidlit), so thanks for the belly laughs! Such fun to read and reread this list! Diary for a Worm was new to me...it goes on the list to give to my grandchildren! Love Maira Kalman, looking forward to 'meeting' Petra Mathers, and revisiting the others on this great list. Funny is the best (and perhaps hardest). Really enjoyed taking a humor break with these choices. Love Goat and the earnest Stanley. Laurie, you came to our school, and I still remember your touting the benefits of silliness. The kids totally agreed! A super silly list. Thank you. Thank you for illuminating the ways in which to read mentor texts in order to enhance, expand and enrich our own writing. Some old favorites and some new discoveries on this list. I especially loved "Diary of a Worm." Thanks Laurie! I get excited when anyone mentions THE TRUE STORY OF THE THREE LITTLE PIGS. I just can't get enough. Thank you for sharing. Great book list! I also never knew that Laurie used to live in KC. I grew up there and loved The Reading Reptile too. I love these books, especially the True Story of the Three Little Pigs. Arnie the Doughnut is so inventive--my son has read it numerous times. Great books to get us "in the mood". Thanks for the list, Laurie. The kids at library story time love silly stories and begged for more when I read some of your favorites.The True Story of the Three Pigs topped their list of favorites. Here are some authors to check further and some books to own. Thank you for this list. I love this list of books! There's a few I haven't read yet so I'm excited to check them out. Thank you! Thanks for sharing your journey and book list! What a collection of funny books! George is my personal favorite! rhyming dust bunnies was very inspiring! you're right it's hard to be super funny with so few words! I enjoy good humour in picture books. I have read most of the books on your list and I'm asking the library to bring in your books for me to borrow. Thank you, Laurie, for an interesting and informative post. I am bad at silly, though I've loved a couple of the books on your list. Looking for the rest to bring out my silly side. Thanks, Laurie! I love the humor, Laurie. I will put on my thinking cap to see what I can do. These books sound like fun! Thanks! Thanks for your great recommendations. Your books are always fun to read too!